Still plenty of punters in with a chance in this year's comp with only 5 points separating 16 tipsters. Andy, Sam Griggs and BillyCat remain top 3 in that order on the Tipping Ladder but were reeled in by Arnold Layne and that stalwart in defence Craig Nettlebeck. Following them is a veritable raft of tipsters separated by a mere nothingness. In the Margin comp we have a huge break made by The Lace who hit the lead for the first time last week, and has extended it to 6 goals over #Car17on and DrBB in 2nd and 3rd respectively. Quokka and Simon Williams fill 4th and 5th but have their work cut out for them being 7 or 8 majors behind the lead. A special mention must go to gonadbreath who set new records dropping from 5th to 30th in two weeks, which is an eternity in modern footy margin tipping. We have a new leader in the Trivia comp with Rotten Ronnie taking the lead from yours truly by a solitary point in a ring a ding ding cliffhanger that has the crowd on the edge of their seats. To join the Trivia comp, login to footytips.com.au then go to http://www.footytips.com.au/tipping/afl/trivia. The Lace is having a purple patch picking the perfect round of a full card and spot on margin to take out this week's weekly prize which was $10. Lazybustard and BecCG also picked the round but were further off with the margin. For the record I was the worst tipster this week, mainly due to my tipping of Greater Western Sydney to get up over Geelong. I'm still trying to work out how my account was hacked. The Prize Pool is finalised at 26 tipsters and $520 up for grabs for the season. See the Prize page for details. 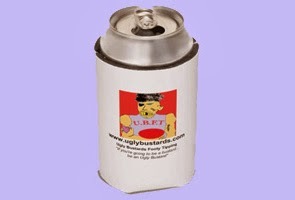 To be eligible for any of the prizes on Uglybustards you need to have paid your entry fee. If you are not in the Prize Pool you can still play for glory and get your name in the Hall of Fame. this is my comment on this post. is it a good post? yes..... not sure what the 1st prize is for posting the best blog?